I was up late the other night watching YouTube videos of TLC reality shows. I came across one of their more ridiculous shows "Trophy Wives" about these young women in Beverly Hills who are married to old billionaires. I started to watch a trailer of one of the shows and one of the reality stars reminded me of my friend Sonia White. I had lost touch with Sonia in the past few years so I decided to google her to see if I could find her on online. I put her name into google and instead of finding her on facebook, I got her obituary. It broke my heart and I could not sleep the rest of the night. 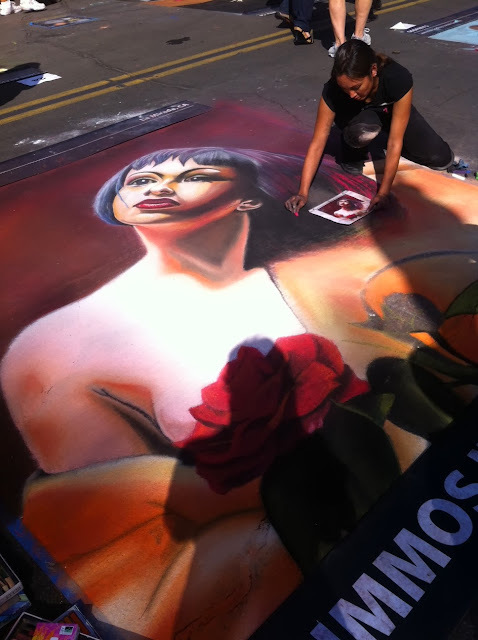 Chalk Art - Little Italy! The food was tasty as well. San Diego maybe a small city but we do have some great cultural activities. We Have Come a Long Way Baby..But We Still Have a Long Way to Go! Recently I read the book called Lean In by the COO of Facebook, Sheryl Sandberg. In her book she covers many topics that working women deal with and offers practical solutions on how to overcome them. Its modern successful women like her who are great examples for females of all ages and most importantly young women who are just starting their careers. I think women have come a long way in the past 50 years, but I had an experience recently that made me realize we still have a long way to go in terms of workplace equality. If I can share my experience and it helps someone else then its worth putting myself out there, hence this blog post.